A bunch of designers were coming to Automotive Designer’s Night Tokyo which was held at AXIS gallery, in Roppongi, Tokyo, titled Kurumaza 車座, literary means sitting in a circle, 車 means car in Japanese, as a pre-event of Tokyo Motor Show 2009. The room was packed and loud, so it was hard to catch what neighbors are saying. Attendees might discuss and talked about something hot topic related to car vehicles or ecology issues. The medias reported the Tokyo Motor Show was shrinking because of the withdrawal of Euro and US car makers, but the room was warming up and seemed to be no sign of descending car market but filled with emotions to the future. 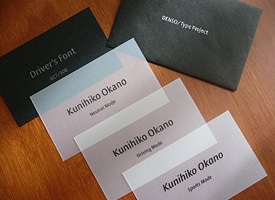 The sponsor companies showed its products there, Denso previewed Good Design Award 2009 Frontier Design Award Winner Driver’s font and provided the series of business card-sized papers to applicants. They could get the cards with their name printed by Driver’s font. 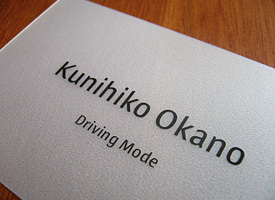 It contained 4 cards, 3 styles of Driver’s font, Driving, Neutral and Sports Mode, plus a serial number card. There seem to be a lot of hurdles in order that Driver’s font will be available in automotive instruments, but I hope the fonts will be welcomed by car makers. The series of cards provided by Denso at Automotive Designer’s Night Tokyo. Tokyo Motor Show 2009 will be held from October 23rd through November 4th.